Find a way to make a difference with your creativity. 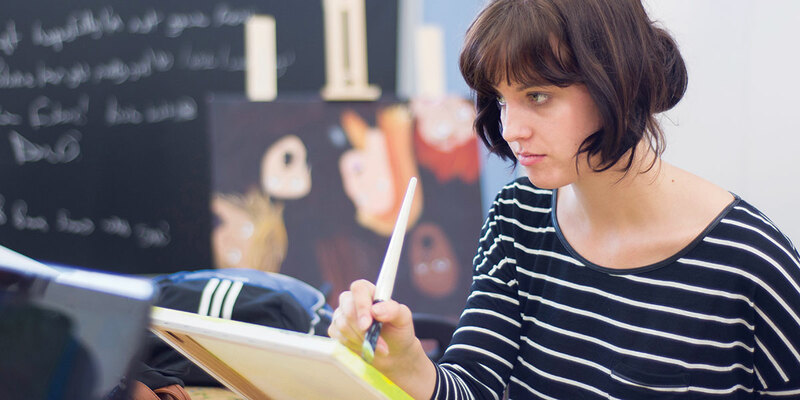 The Fine Arts – Advanced program will push you along the path you have chosen, challenging you through critical discussions, pointing you to artists with similar concerns and aesthetics, and encouraging you to grow and achieve the potential evident in your preliminary explorations. This program will prepare you to address the complex challenges of the 21st century and promotes citizenship by educating you not only for careers and jobs in the visual arts, but also for your role as an active and engaged community member. NOTE: Students enrolling in this program are required to purchase their own laptop. For specific hardware and software requirements for this program click here. You will learn to use your skills and talents as an artist, developing a personal aesthetic and making significant contributions to the local culture and economy by collaborating with community groups and not-for-profit organizations. You will also benefit from experienced faculty and close proximity to galleries, museums and studios located in Durham Region and across the Greater Toronto Area. Through the production of a comprehensive portfolio of work, you will possess the combination of professional studio experience and entrepreneurial skills required to build a successful career in this vibrant sector. For a complete list of hardware recommendations please review the Hardware recommendations and FAQ document. Membership in Adobe Creative Cloud™ is included in your Student Fees and will be made available during your first week. There is no need to purchase a subscription. Creative Cloud brings together everything you need to create your greatest work. One simple membership gives you and your classmates to the very latest versions of all the Adobe professional creative desktop applications like Photoshop®, Illustrator®, Premiere Pro® and more — plus new features and upgrades as soon as they're available. And that's just the beginning. With Creative Cloud™, everything you need to create intuitively and collaboratively is included. All students MUST have a Cat 5e or Cat 6 Ethernet cable 2 meters long to connect to the campus network and an adapter to connect to Ethernet depending on the laptop. NOTE: These requirements were accurate at the time of posting and are subject to change. Please be aware that hardware and software versions are subject to change and will be updated as needed.